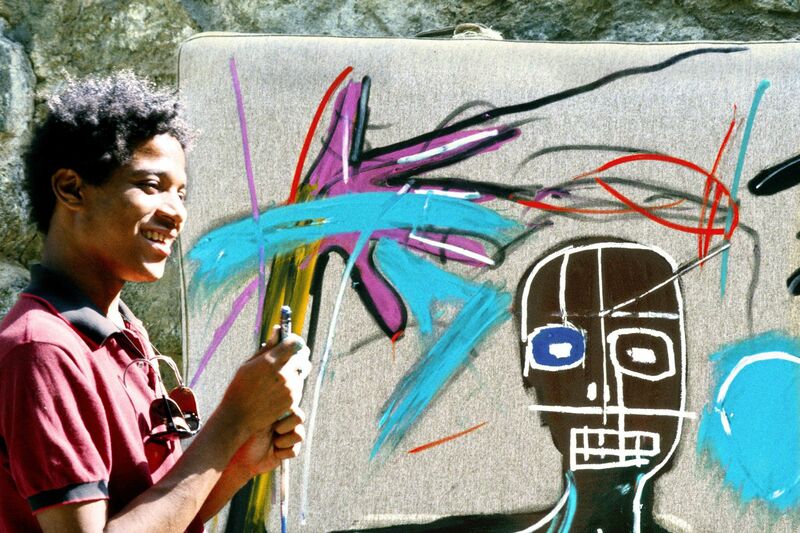 Jean-Michel Basquiat shot to fame in the early ‘80s as a painter with bright strong flashes of color, streaks of black, jagged, oddly angled heads and crossed-out words, then died of a heroin overdose at age 27. His story has been told many times before—in Glenn O’Brien’s loosely crafted 1981 fiction film Downtown 81 (aka New York Beat) about a Village artist struggling to pay the bills; in Julian Schnabel’s 1996 film Basquiat, with Jeffrey Wright’s alternately shambling and alert performance in the lead; and in at least seven books, including Phoebe Hoban’s journalistic 1998 biography Basquiat: A Quick Killing in Art. Now he is the subject of friend Tamra Davis’s documentary Jean-Michel Basquiat: The Radiant Child, which announces its intentions to uphold its subject’s legacy from the title onward. The film is framed inside and between an interview Davis filmed with Basquiat a few years before he died, a neat structuring device that allows him to speak for himself. But Basquiat also proves inarticulate on many points (clamming up about what his work means, for instance), and so the movie intercedes on his behalf. Beginning and ending with the Langston Hughes poem “Genius Child” (choice line: “Nobody loves a genius child”), the film offers an image of Basquiat as perpetually misunderstood, discarded, and tormented. Much of this seems fair; for instance, the film rightly points out the irony of how Basquiat’s status as a black artist in a predominately white scene, which partly helped him make him famous, soon became an easy label—and one, furthermore, which he despised. Yet the film’s salvation effort feels ironic. It would be absurd to say that any one book or film could present the true Basquiat, but in attempting to rescue Basquiat from other peoples’ labels, the film also applies its own radiant genius child label to him. Example: The film shows us many of Basquiat’s paintings (I didn’t count, but at least a hundred), often zooming into or out of them while music or voiceover plays on the soundtrack. It’s true that film is not painting, and that a moving art has to do something with a static art to make it its own, but what happens with Davis’s approach is that the viewer gets a brief introductory flavor of Basquiat’s art without having the time to consider it (I even wrote down many paintings’ names to look up online later). You see the paintings and hear people praise them, without the space to consider them in between. Unlike many recent documentaries, though, which drown their subjects in platitudes, the movie does mix in actual biographical and critical material with its praise; you are instructed and informed on the life. But the quick painting shots do represent the film’s light brushstroke approach: a mention of Basquiat’s increasing heroin habit late in life, but little about his earlier drug use; anecdotes about his desire to please his father, but polite looks past alleged childhood abuse. The radiant child had some dark places, darker than the movie seems willing to admit. The film’s a decent introduction to a man who walked the world of SoHo, CBGB, and Andy Warhol’s final days, but the more you know going into the movie, the more you sense it leaving out.